A stock corporation is a for-profit corporation which has shareholders (stockholders), each of whom receives a portion of the ownership of the corporation through shares of stock. These shares may receive a return on their investment in the form of dividends. Shares are used for voting on matters of corporate policy or to elect directors, at the corporation's annual meeting and at other meetings of the corporation. If you are considering incorporation of your business (that is, forming a corporate business entity), you have several decisions to make. One of these decisions is the type of corporation you want, based on whether or not you want to have or sell shares of stock in the corporation. If someone has stock in a corporation, he or she has a share in the ownership of that corporation. Individuals with shares of stock in a corporation are shareholders or stockholders. Income for the corporation. The purchase of these stock shares helps to finance the corporation's start-up, operations, and expansion. Owner right to decisions. 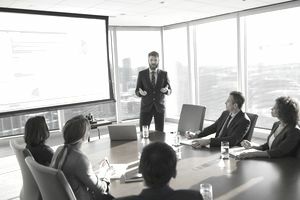 Usually, a share in a corporation buys the owner a right to a vote at the corporation's annual meeting, to elect board members, and have a say in the direction of the corporation. Owner's right to receive dividends. Dividends are the reason most people buy shares of stock. In essence, by selling shares of stock, the corporation's board of directors is trading the money received for giving up some of its decision-making power and sharing the financial benefits of ownership with others. Some corporations, non-profit corporations, in particular, don't offer stock but have memberships instead. As one of the first acts of a new corporation, decisions must be made about the amount and kinds of stock that will be offered for sale. The more stock, the more spread out will be the ownership. The corporation also must decide whether the stock will be offered for sale publicly or privately. After the decision has been made, the Articles of Incorporation include the initial number and price of shares to be issued. The corporation then begins the process of offering the stock for sale, either publicly or privately. If one person owns one share of stock more than any other person, that individual is said to have "controlling interest" in the corporation. A corporation may switch back and forth between non-stock and stock status. This happens often in the start-up phase of a corporation when it is small and decides initially to have no stock. As the corporation grows, it needs financing and decides to offer stock to the public through a stock exchange. This is called an IPO (Initial Public Offering).